Of all of the frequent parts of my childhood, I remember vacationing in Ocean City, NJ almost every summer for the first 18 years of my existence. While I immensely love the natural draws such as the beach, the fresh summer air and the ocean, the man-made attractions such as the boardwalk, salt water taffy, caramel popcorn and various amusements inhabit my really vivid memories. But boy howdy how Ocean City differs in the winter, as typical for a resort/vacation town. Nothing is really open, the streets are barren and the only thing to do is polar bear swims (I am currently at 21 separate swims). Yet aside from visits to such towns along the coasts (at least in NJ and Oregon), I can't say I've been to many non-coastal resort towns that don't hold at least two seasons worth of tourists. Lake George is probably one of the few exceptions. I've been to the town twice in my life, the first for a Geology field trip in October as a college freshman and then as a recent stop on a trip to Lake Placid; both times the town has been practically empty (even the McDonald's was closed for the season!). But aside from the lack of bustle, there was still one draw for me. 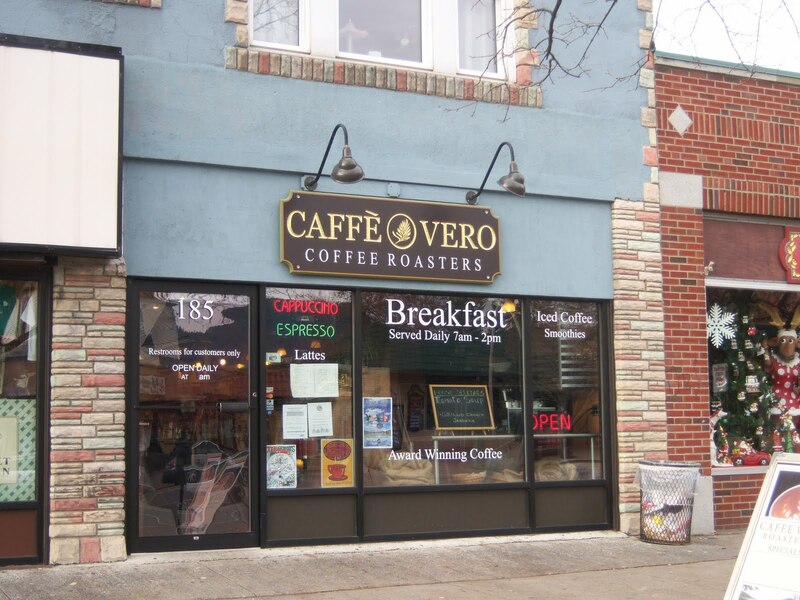 Word had it that a place called Caffe Vero Coffee Roasters was doing some good things with coffee and espresso. Delighted to find a possible good coffee stop in so barren a coffee area, I practically sprinted out of the car and through their front window (ok, maybe I wasn't that extreme, but it felt like it). The interior had a nice long counter up front and in the back, a seating area arrayed in mountain lodge style with plenty of old wood seating amidst a roaring hearth. I stepped up to the counter and ordered their house blend (a medium roast) and an espresso. The drip proved good, as it reminded me of root beer, ginger, a touch of earthiness and as it cooled, a tinge of cream. The espresso, a dark blend extracted by skilled hands, demonstrated bitter and dark but had some nice flavors of chocolate and citrus (had the blend been different, maybe lighter, the espresso would have been better). The tea is free leaf. So, though Caffe Vero had a few disappointments, the place seems to hold tremendous promise. 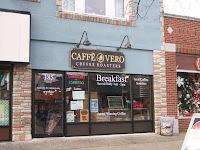 If you happen to be in Lake George for either summer vacation or a winter pit stop, give Caffe Vero a go. I used to go up to Lake George every summer. However, I haven't been there for several years. I think the last time I was up there, I don't remember any coffee besides from McDonalds. Good to know there's some place worth checking out next time I journey up there.